I saw Owl and the Japanese Circus was up for review a while back, but at the time I was trying to restrict myself as once again my review list was creeping up and up….wish I’d got it though as this looks to be a great series, but incredibly full of different supernatural characters that link in to Owl and her complex life. I followed this ok, but think I missed some of the subtleties and nuances that I may have understood better if I’d read book one – and of course got the Train wreck/Whore statements in some kind of context…they shocked me a bit the first time, said in a kind of apologetic humour and I didn’t follow the logic. There’s a lot like that, where I think the earlier book would have set the scene for me. Its a real action packed adventure – poor Owl doesn’t seem to get a break, going from one disaster to another. I love her and the gang she’s somehow acquired. On/Off boyfriend Incubus Rynn, the talented, quick thinking Nadya, Captain the vampire hating Mau cat and of course Carpe, World Quest partner and hacker extraordinaire. Owl is indebted to the Dragon shifter Mr Kurosawa, working for him but not exactly voluntarily. And this time the treasure he wants is deadly…. Poor Owl, her intentions are good but each time she somehow gets into trouble, with a whole cast of Supernaturals out to get her. then there’s the IAA, usually just an awkward inconvenience but now they seem to have focussed on getting her, and are round every corner. She really needs the help of those friends this time, and as always the search is on for maps, hidden traps and of course the clock is ticking. It could be a story that’s so complex that it makes me switch off, often adventures like this do just that even though others adore them, but its not. The humour permeates through all the dangers and keeps it feeling light and not bogged down in details and battles, the pacing is fast but easy to follow, the dangers and fixes out are fun and its a really enjoyable read. The detail is incredible, Owl rattles off stats and facts about identifying antiquities as if she’s simply compiling a shopping list, Nadya has so many contacts to help them escape, and of course World Quest and Carpe provide the maps telling them where things are found and something of the traps they can expect. 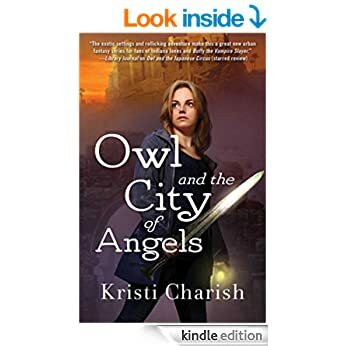 Good to know when the dangerous Supernaturals contained in them are usually the eat or kill variety….Rynn – seems he’s always trying to protect Owl, usually from herself and her spontaneous decisions, but of course he’s mainly there in the aftermath rescuing her yet again, and trying to persuade her that what she wants to do is not the best course of action. I’m not sure of the connection between him, Mr Kurosawa and Lady Siyo, he seems to have more respect from them than would be expected of simply an employee, but as yet I’ve not worked it out. Alexander pops up again, still angry at Owl, Lady Siyo still dearly wants to kill Owl but isn’t allowed, we meet Carpe in person, Rynn’s Cousin and a host of Somali pirates, and Owl somehow has to negotiate her way through yet another series of life threatening dangers, not really knowing who to trust except Rynn and Nadya. I’ve really enjoyed this read, its made a change from the usual fantasy fare and its a fun series. I love Kim Harrison and Jenn Bennet’s novels, and I’d agree with the comparison to their works, the same kind of fun even in danger and attention to detail that make them feel so real. Stars: Five, a cracking story, definitely one to reread and a series to watch out for.